Pope Francis landed at Rabat-Sale airport this afternoon in an atmosphere of warm welcome and celebration. 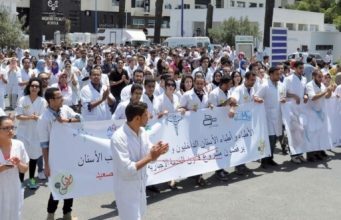 Rabat – Under the cover of surrounding buildings, dozens of people lined the streets of Rabat to welcome Pope Francis to Morocco, whose two-day visit will focus on interfaith dialogue and issues of migration. 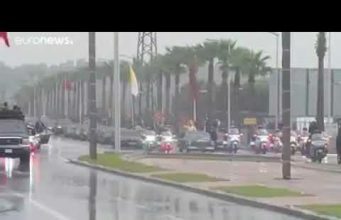 Rain showered the waving flags of the Vatican City and Morocco during the pope’s drive from the Rabat-Sale Airport to Hassan Tower. The overcast weather led to the cancellation of the pontiff’s parade down Mohammed V Avenue, his official welcome and greeting by King Mohammed VI at the Royal Palace. Instead, King Mohammed VI received the pope at the airport and escorted him to Hassan Tower — a long awaited meeting that was first officially announced in March. The last papal visit was 34 years ago in 1985, when Pope John Paul II was invited to Morocco by the late-King Hassan II with a similar hope of building a bridge between Muslims and Christians. 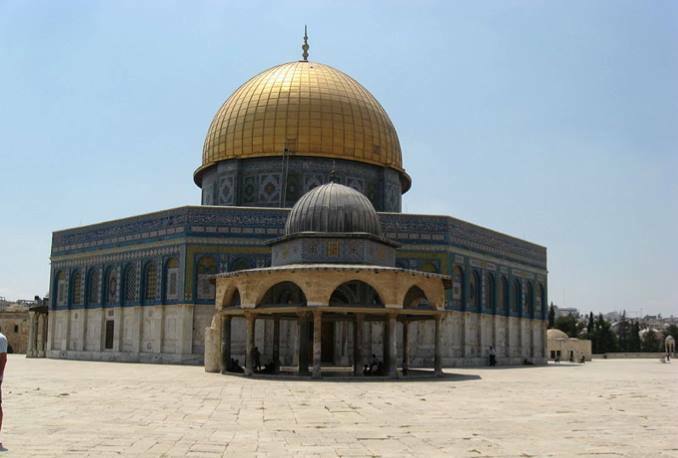 In line with their commitment to interfaith dialogue, Pope Francis and King Mohammed VI signed the “Al-Quds Call.” The aim of the document is to promote the holy city of Jerusalem as a shared heritage of humankind. Amid news of political and religious divisiveness surrounding the historic city, the king and the pope said they hope to contribute to its safeguarding as a place for peaceful coexistence. King Mohammed VI introduced the pope by giving an opening speech at Hassan Tower. “Today’s visit falls within the framework of the long-standing relations between Morocco and the Vatican. I was keen to make sure the place and the date of the visit reflect the symbolic depth, the historic significance and the civilizational importance of this meeting,” said King Mohammed VI. 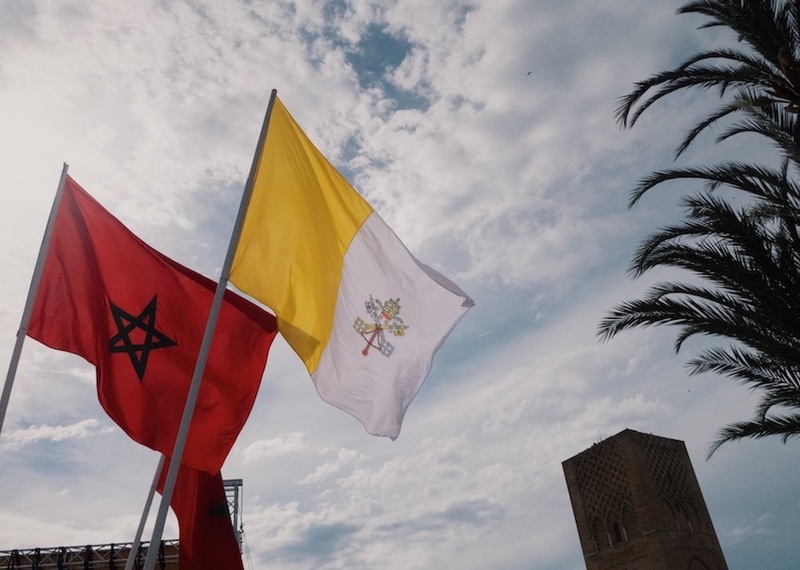 Following the pontiff’s departure from the Hassan Tower complex, the rain stopped and the sun shined on the dozens of Vatican City and Morocco flags raised in honor of Pope Francis’ visit. Photo taken by Stephen Higgins/Morocco World News. 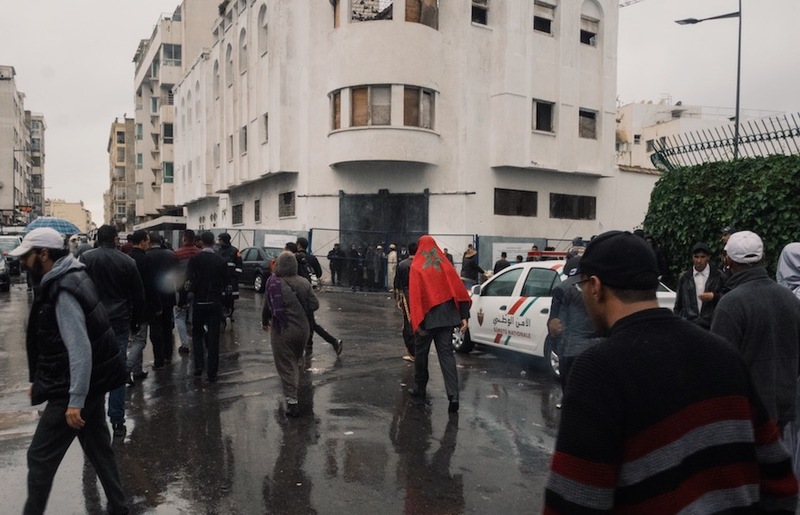 After the king’s welcome, the pontiff gave his address to Moroccan authorities gathered at the Hassan Tower complex as hundreds of people in the neighborhood watched the historic event from the streets. Peaceful collaboration between Muslims and Christians is a central element of Pope Francis’ visit and speech. 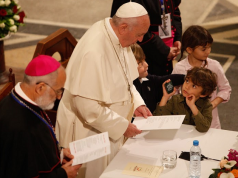 The pontiff has continuously advocated for greater interfaith dialogue throughout his six-year tenure. 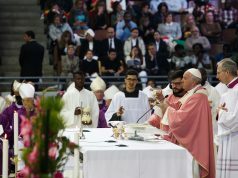 “I would like to affirm once more our need for cooperation in giving new impetus to the building of a world of greater solidarity, marked by honest, courageous, and indispensable efforts to promote a dialogue respectful of the richness and distinctiveness of each people and every individual,” said Pope Francis during the speech. These statements come 15 days after a terror attack on two mosques in Christchurch, New Zealand, which left 50 people dead and at dozens more injured. After his address, the pope paid his respects at the Mausoleum of King Mohammed V before leaving the center of Rabat to visit the Mohammed VI Institute for the Training of Imams, where he met with Islamic scholars and students. The pope’s day ended at the headquarters of the Caritas migrant center, where he conveyed messages celebrating hope and shared humanity to a group of sub-Saharan migrants. Dozens of people braved the rain to listen to Pope Francis’ speech, which was broadcasted on screens in the surrounding avenues of the Hassan Tower complex. Photo taken by Stephen Higgins/Morocco World News. 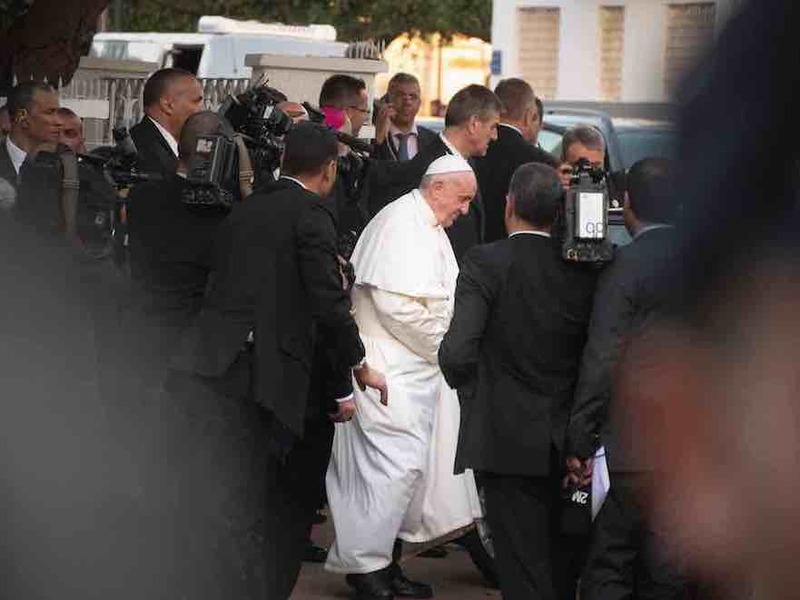 Catholic sub-Saharan migrants made up the majority of the people who, waiting outside the Caritas migrant center or packing the vicinity of the Hassan Tower Complex, came in flocks to watch the pope speech. Veronique, a migrant from Cameroon, who declined to give her last name to Morocco World News, hopes the pope’s visit will lead to a brighter future for Christians in Morocco. 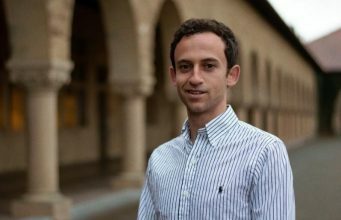 The 32-year-old is a Roman Catholic and a member of the Christian community in Morocco, which is approximately 2,000 to 5,000 people. 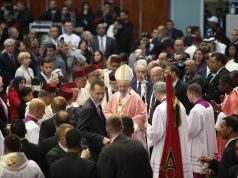 Days before his visit, the pontiff thanked King Mohammed VI for allowing him to use Morocco as a platform to share his “profound convictions” of forgiveness, tolerance, interfaith dialogue, and peace. 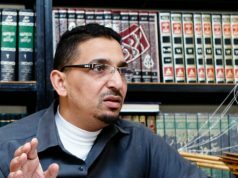 “As Muslims and Christians, we all believe in one God, the creator and most merciful who created men and established them in a shared world so that they live together as brothers and sisters and help each other in times of need,” said the pope in a video message published by Vatican News. 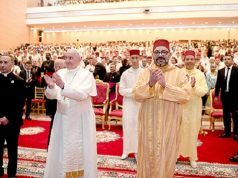 During his address at Hassan Tower the pope again brought up his gratitude to Moroccan society and his hopes for the Christian community in Morocco. As the pope spoke to the group, fellow Catholics, some of whom had come from Spain to support the pope, waited along with the many sub-Saharan migrants outside the Caritas center. 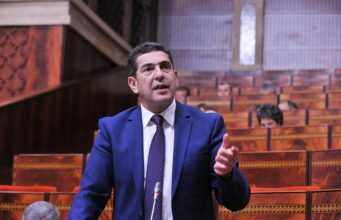 Lobato, along with five companions, traveled from Spain to Morocco by ferry to see the pope and show their support for his positive platform on interfaith dialogue and migration. The six Spanish travelers said they are looking forward to attending Pope Francis’ events tomorrow before taking the ferry home. Following his meeting at the Caritas migrants center, Pope Francis retires for the night as supporters cheer across the road. 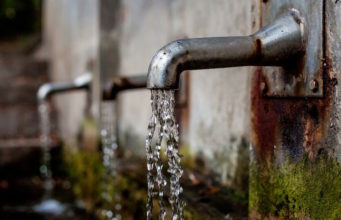 Photo taken by Stephen Higgins/Morocco World News. The pope will begin his second and last day in Morocco in the city of Temara, just southwest of Rabat. 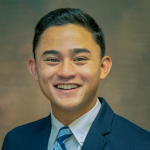 There, the pontiff will visit the Rural Center for Social Services. 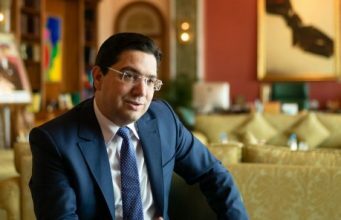 He will then proceed to meet with priests and the Council of Churches in St. Peter’s Cathedral in Rabat, before traveling to the Prince Moulay Abdellah Stadium, where he will host a mass. 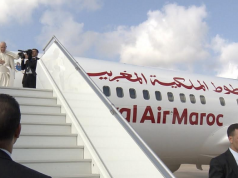 The pope will then expect to leave for the Rabat-Sale Airport, where he will have a farewell ceremony before his flight back to Rome. 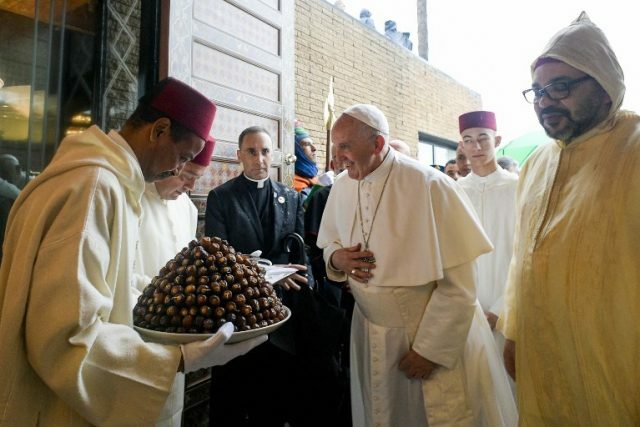 Morocco is the second Arab country the pope has visited in 2019. The pontiff spent three days in the United Arab Emirates from February 3-5. During his UAE stay, Pope Francis reiterated his commitment to themes of inter-religious dialogue and solidarity among different faiths. According to Vatican News, Pope Francis’s next international visit will be to Bulgaria and the former Yugoslav Republic of Macedonia from May 5-7.